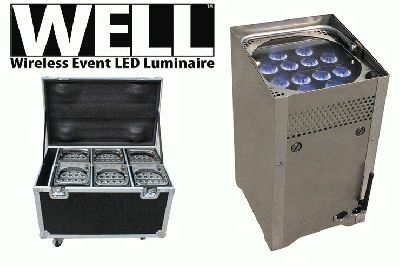 Chauvet®, a leading manufacturer of LED lighting, announced the launch of over a dozen new wash lights, moving yokes and event lighting fixtures at LDI 2010. New members joined the popular COLORado™, COLORdash™ and Q-Series™ family of products—enhanced with tri-colored LEDs, IP ratings and more. The all-new WELL™ event luminaire made its debut. Additionally, all products mentioned here in the COLORado™ IP range feature a pressure-equalizing Gore™ valve and an improved durable, heat-dissipating housing. WELL units are available individually or in a six-slot road case that can charge all the units. Inside each wash light are 12 3W tri-color LEDS. It’s powered by a 12V battery for up to 12 hours of life and fits inside a piece of truss. Control is via DMX, and the unit also carries a Wireless Solution WDMX receiver. Focusing is accomplished two different ways; the split LED plane can be precisely angled using the adjustment screws on the outside of the fixture, or for more dramatic adjustments, a ratcheting foot can be extend to tip the fixture several degrees without compromising stability. COLORado™ series is born from our extensive experience with outdoor events and installations combined with the evolution of technology. They are designed for the harshest environments, and are ready to take on any installation from cruise ships to festival lighting, washing building exteriors to outdoor signage. 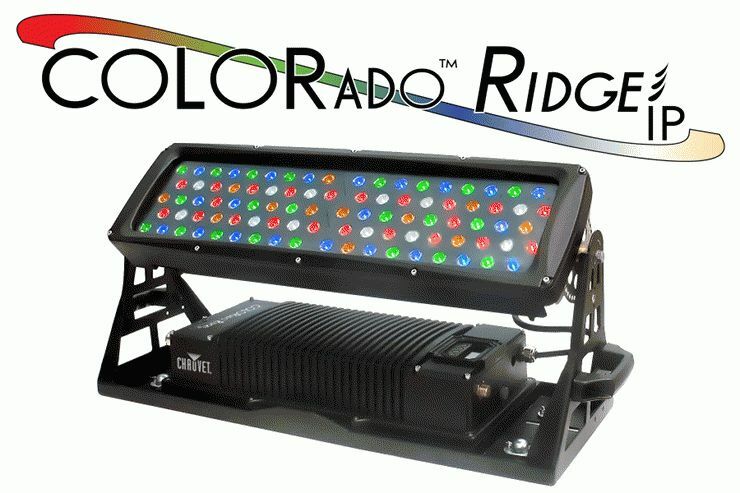 COLORado™ 1 IP features a total of 42 bright and powerful RGBW LEDs and an IP66 rating. COLORado™ 1-Tri IP encompasses all the COLORado™ 1 IP offers, but uses 14 tri-color LEDs and its smooth color mixing is perfect for front light applications. COLORado™ Range IP is a true LED powerhouse with a combined total of 180 5W, RGBWA LEDs and two independently adjustable heads covering anything from a cyc, to an entire stage, or a building with just one fixture. 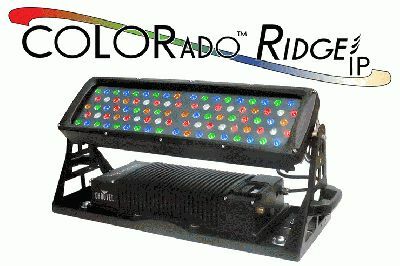 COLORado™ Ridge IP packs a major punch and consists of a single panel with 90 5W, RGBWA LEDs packed in a tough and sturdy frame. 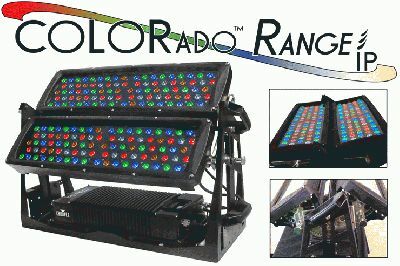 COLORado™ 1 VW Tour has a combination of 42 warm and cool LEDs creating a range of color temperatures from 2,700 K to 7,000 K for applications ranging from high-definition video and television to big-punch white light effects. 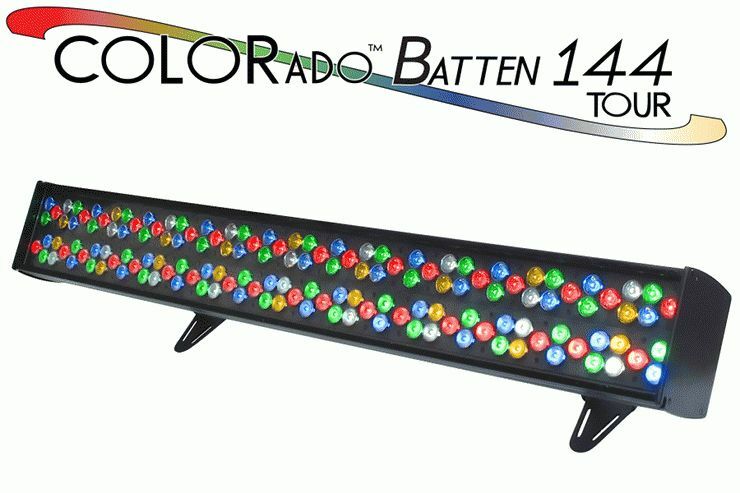 COLORado™ Batten 144 Tour offers the same wide spectrum of RGBWA color mixing from the massively successful COLORado™ Batten 72 Tour, a Parnelli Awards nominee, with twice the LED output—featuring 144 1W RGBWA LEDs. With 10 and 30 degree optics, it offers an even wash of color—over a 10-meter surface—and the unit’s low profile and low heat emission give you the versatility to squeeze it into the tightest spaces for powerful and surprising effects. COLORdash™ series are small on size, but big on performance. They’re perfect for retail displays, museums, restaurants—the possibilities are nearly endless. Plus, the on-board driver and dipswitches allow plug-and- play applications without the need for programming. COLORdash™ Par-Tri uses seven 3W combined tri-color LEDs to create a solid-color output that nearly eliminates multicolored shadows. It comes with a set of barn doors to help control light spill and provide excellent warming for Euro-style truss. COLORdash™ Batten-Tri not only provides flawless solid colors for uplighting surfaces it’s also highly effective as a striking effect light. The pixel mode personality allows control over each of the eight high-powered, tri-colored LEDs. COLORdash™ Accent UV can be used as a single blacklight effect and as an effective complement to any RGB or RGBW light source where a little more of the spectrum is needed for better color rendering. COLORdash™ Accent VW is a rugged variable white ­fixture creating shades of white from 2,700 K up to 7,000 K with smooth, flicker-free operation. Q- Series has always stood for quality and value. Now it also stands for groundbreaking LED technology as two new members join the very popular Q-Spot™ 260 LED and Q-Spot™ 160 LED to further enhance this game changing series. Q-Beam™ 260-LED provides a tight, 6-degree, super-bright beam. Complete with an 8-position color wheel, a 7-position interchangeable rotating gobo wheel, and a 3-facet prism, this light cuts through haze with lightning-fast speed, creating a brilliant shaft of light and defined aerial effects. 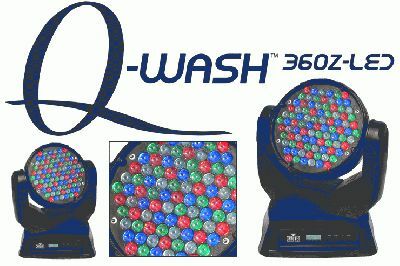 Q-Wash™ 360Z LED is a lightweight, LED powered moving yoke wash with a variable zoom (eight to 40 degrees) and RGBW color mixing. It boasts a whopping 91 3W, RGBW LEDs and incredible pan and tilt speed.